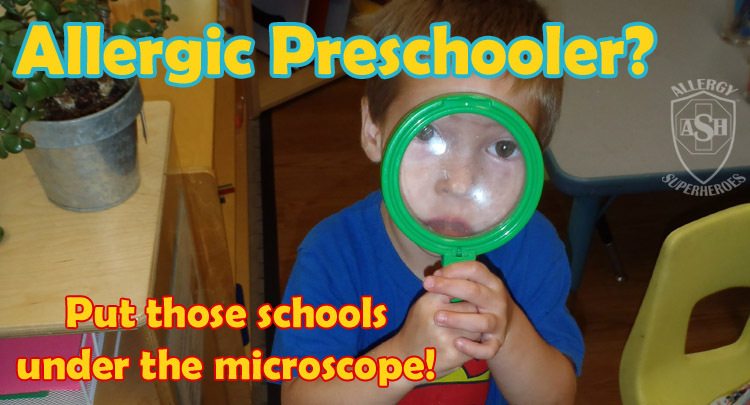 If your child will be 3 or 4 by this fall, it’s time to be looking at preschools. “What’s that?” you say? “Already?” Yes, indeed. Many programs begin enrolling in February, and some may even have started. Plus, the most in-demand schools fill up fast and can generate lengthy wait-lists, so you don’t want to put this off. This is a daunting prospect for any family, particularly when doing it for the first time–and when your prospective preschooler has food allergies, it gets even more complicated and intimidating. Especially if your kiddo has only been cared for by family or in a home-setting until now. When it was time to find a preschool for Zax, I thought I knew all the right questions. Not only had food allergies been part of my whole life, but my mother had been teaching preschool since I was 8 years old. I even had my eye on a program run through our city that felt good. What could go wrong? As it turns out, a lot. 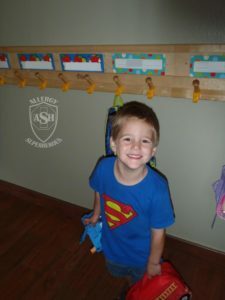 Since I had been a stay-at-home mom, sending Zax off to preschool was the catalyst that would eventually lead hubby and I to create Allergy Superheroes. 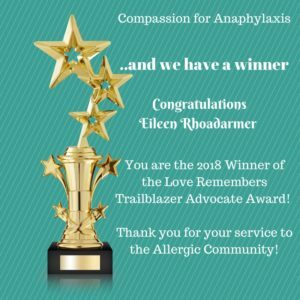 The world needed more allergy awareness! Our kids ultimately attended a private preschool in a local church. The school was nut free, and kids brought their own food for lunch and snacks. They kept our kiddos very safe and we felt good there. Our experience was unusual, but it highlights the need to know what questions to ask, what policies to check, and what certifications to verify when selecting a school for an allergic child. Few preschools are state-funded so they’re typically private schools, and it’s very important to find one that meets your needs. 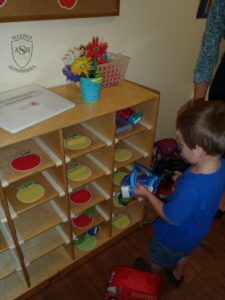 The following is a list of all the things to do and ask when selecting a preschool. 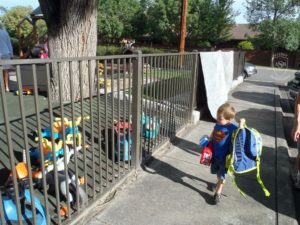 Some of these I wish I’d known before we started, and I’m sharing in the hopes that your preschool search may be smoother than mine. First and foremost when looking at schools, make sure they’re licensed and up to date. Ask who licenses their programs, if this isn’t published on their website or literature. Prior to our experience, I wouldn’t have thought you COULD have an unlicensed preschool program, but the program in question thought they were covered under recreational licenses, which turned out to be wrong. Visit schools you’re interested in, preferably during school hours. The best way to get a sense of how comfortable a school makes you is to be on the premises when students are. You’ll be able to watch the teachers interact with kids and watch parts of their day unfold. You may even get the chance to witness how food is handled, and you can get a lot of your questions answered while you’re there. Don’t shy away from preschools in churches when the denomination doesn’t match your world view. Many such preschools are independent of the church–or they choose to keep things secular most of the time, even if they aren’t. 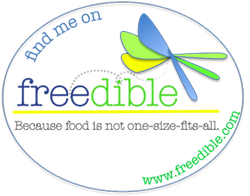 If they have a good program and are nearby, check them out to see if the school itself would fit your child. A personal visit will tell you a lot about how they run things. Red Flag: Beware of any program that tells you that they will “assist” with emergency medication or utilizes a “hand over hand” technique. I first heard of this 15 years ago from an old coworker who was also a part-time EMT (presumably for a private company.) She told me that they were not allowed to use a person’s epinephrine auto-injector on them, but they could “assist” by placing their hand on top of the person’s. I don’t know the origin of this, but it sounds like a liability thing. There are major problems with this when it comes to preschoolers. First off, any school that relies on this technique has likely not undergone any training on emergency medication, which means they are also not trained on what signs and symptoms to look for. And any parent of an allergic preschooler knows that you can’t depend on a three-year-old to tell you when meds are needed. This could also result in a delay of epinephrine administration. It’s one thing to hold an anaphylactic child and administer epinephrine to them. 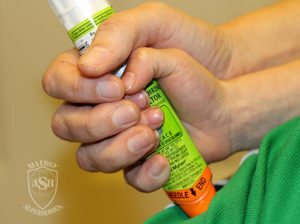 It would be quite another to convince that child to grab the EpiPen so you can put your hand on top of theirs and then administer it together. Even if the child isn’t panicking (which they may be), what if that particular child is frightened of the Epi? Little kids can be stronger than we think. If they’re scared they may fight, push the Epi away, pull it out after only one second, or make it misfire and shoot its life-giving medication across their pants instead of into their body. This would seriously complicate their care and compromise their safety. You can certainly train the teachers yourself on symptoms and how to administer the medication, but this is also a red flag because it probably means that they are not certified to administer medication. There’s no need to “protect a teacher from liability” of delivering a life-saving medication unless they haven’t been trained or certified in its use. This was how we found out that our first choice of preschool was unlicensed. They told us this was how they would have to administer medication because they didn’t have the medication certification. This was about a month before school was supposed to start. My response was “how about you get certified?” I was miffed that this came up a month before school when I had registered several months previously. They told me they would get certified. But then, the day before school started, I got a phone call that they had taken the class and passed it, but that they were not awarded the certification because their preschool program was unlicensed. Which highlights why the licensing question is the very first question you should ask. 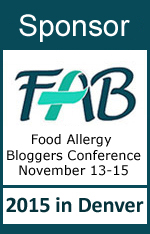 Find out what their food policies and allergen policies are. What meals/snacks will they eat? Who provides food? Where do they eat? How do they clean up? How do they teach kids about not sharing food (or do they)? Do they prohibit certain ingredients? If all foods are allowed, do they make kids with allergenic foods (or kids with allergies) sit somewhere else? What do they do if someone “forgot” and sent food that is prohibited? If snacks are communal, will they take steps to keep allergens out? Do they have somewhere adequate to store a Safe Snack Stash for your child? At our school, the kids took turns being “snack kid” for Zax’s time there, but they shifted to each kid bringing their own snack when Kal attended. To some extent, I liked having the shared snacks because 1) it trained Zax to ask EVERY. SINGLE. DAY. whether the food was safe for him, which has greatly helped him pay attention to food as he has gotten older. We had a bag of safe backup snacks for him (and safe birthday snacks) for times when it wasn’t. Asking every day also reminded his teachers to double check, in case they’d forgotten. (He’s egg-allergic too, so even being nut free there were times that he couldn’t share the snack.) and 2) when the food was safe, it got him out of his comfort zone and trying new foods he wouldn’t try for me. And he’s picky, so that was nice. On the other hand, having each kiddo bring their own snack meant a much smaller margin for error when Kal attended–everything we sent was safe. But he didn’t get the daily practice of asking, so it was less of a habit for him once he started kindergarten. Both models can work, it just depends on how the school handles things. Find out how they handle parties, other shared-food events, and in-class baking. Kids love these activities, but you want to make sure communication is always open, and that they have good policies in place to keep your kiddo safe. You will probably find yourself doing what allergy parents have been doing for years–reminding people every time, attending the majority of celebrations, and double checking everything. It can get tiring at times, but it’s also fun to participate in a preschool event. Your kids will only be this little for a short time. Because of celebrations, especially birthdays, you will probably want to have a Safe Snack Stash at school even if everything is supposed to be safe for your kid. Parents may forget allergen bans, snacks may come in bearing cross contamination warnings, or you may not be comfortable with homemade treats–and in any of these situations you don’t want your child to be excluded. For birthday backups in particular, make sure you pack something that your child thinks is a real treat, to minimize the feeling of being left out. You might be tempted to declare that your child should ALWAYS eat from their Safe Snack Stash for birthdays no matter what, but I recommend against this. Even if you think this will happen most of the time, if you close your mind to other parents being able to provide a safe treat you may be closing the door on potential allies. If, instead, you check in with other parents before birthdays, you may be surprised at how accommodating they can be. I’ve seen parents include my children by bringing popsicles, Oreos, Dum Dums–and I even met one mom who knew how to make the Wacky Cake! Don’t expect other parents to understand cross contamination. Or even the teachers. Cross contamination isn’t universally labeled for, so it’s impossible for a school to police this. They aren’t going to ask every parent to call a food company before bringing food in. Food allergy families aren’t even in agreement on how to handle cross contamination, so it’s possible that other parents have told them that it isn’t a big deal even if you think it is. You can set the rule that your child is not to eat anything with any sort of cross contact warning, you can even go so far as to say your child cannot eat any food unless you have approved it. But when it comes to what other children bring in to eat, remember that your child is not going to suffer a reaction from another child eating a product that may have cross contamination. Find out where they keep emergency medication. This is going to have a school-specific answer. At our preschool, each class had a med bag that followed the class everywhere. It stayed up high in a closet in the classroom during classroom time. When they went out to recess, it went outside and hung on a hook on a tree. On field trips (which one of us almost always attended anyway) it stayed with a teacher for the whole trip. Other schools will have different policies, so make sure you’re comfortable with it. In addition to ease of access, preschools also have to consider the safety factor of keeping curious little kids out of meds–so it should be out of the kids’ reach but easy for teachers to get to. Some schools will lock meds up because of this. If they DO lock it, make sure the key is extremely easy for the teachers to get to so it won’t slow them down. Keeping Epis in an office is another easy way to keep them out of kids’ reach. As long as the office is close to the classrooms, this shouldn’t be a problem–as long as that office is always accessible while students are present! No matter where they keep the meds, you want to be comfortable with the speed with which they can get them to your kiddo, if needed. And make sure that their policy is to bring Epis along any time the students leave campus. 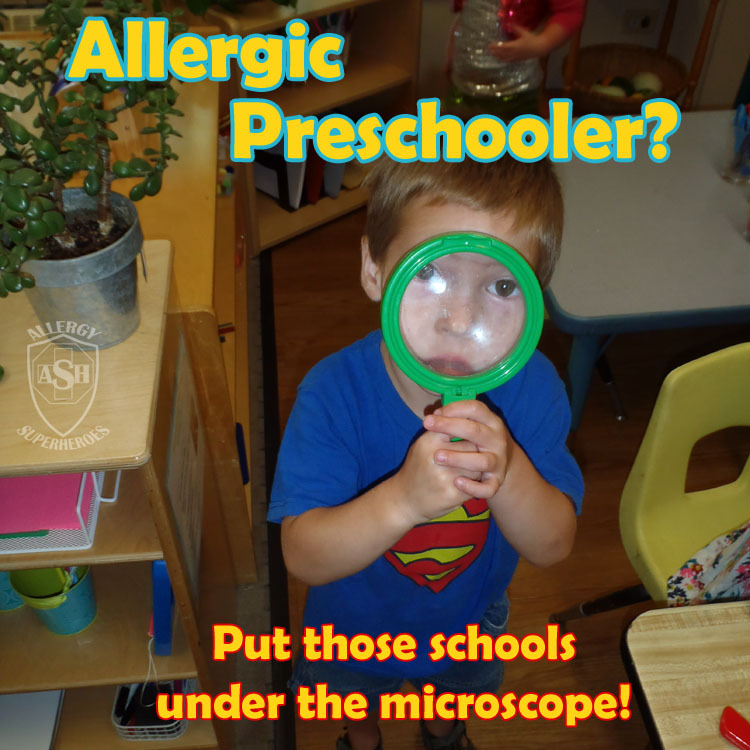 Consider whether you want or need an allergen-free school. Nuts get a lot more consideration than other allergens, so if your kiddo is just allergic to nuts (peanut and/or tree nut), there’s a good chance of finding a nut-free preschool already–or of convincing a school to eliminate them. Nuts have the morbid reputation of causing the most food allergy deaths, so administrators will be more aware of the risks–but this can be frustrating if your kiddo is anaphylactic to something else. If you want to ask a school to ban other ingredients, or if they aren’t nut-free and you want them to be, think carefully about how prevalent your child’s allergens are, how sensitive your child is, and how easy it would be to enforce (and for the parents to comply) before making the request. Here’s the thing: kids this age are messy. I am not universally in favor of allergen-free schools, but the younger the children, the more I think it’s necessary. However, schools cannot ban all allergens. It’s impossible, because people can be allergic to a lot of different things. Nuts are also easier to eliminate–relatively speaking. Okay, so fish and shellfish are probably the easiest to eliminate from a preschool classroom, but if you’re dealing with the other four major allergens (dairy, egg, soy, or wheat), or with allergens that don’t require labeling, you already know that they are in far more foods. And because they’re in so many foods, other parents will have genuine difficulty providing food for their children if a school bans them. (Heck, dairy is a whole food group!) Allergen bans that go beyond nuts will probably be easier if the kids only eat snack at school (fruits and veggies are easy enough.) If the kids need to eat breakfast or lunch, though, you’ll encounter more resistance. So think carefully about what your child needs to stay safe. 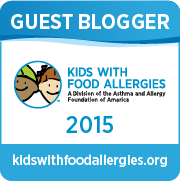 Have you (or your child’s siblings) safely eaten allergens near them? Would requiring ALL students to wash hands after eating keep them just as safe, without the ill-will that often follows outright bans? How about upping table-cleaning protocols for the teachers? Would the school accommodate a ban on allergens in their pure form (milk, string cheese, hard-boiled eggs, edamame, soy butter) but allow them to be ingredients in foods–and would that reduce the amount of allergens enough for your child to be safe from casual contact, when combined with hand washing? There’s no easy answer here, and if you have a child allergic to five of the top 8 plus less common foods, it’s going to be a lot of work. It will be a lot of work no matter how many (or few) allergies they have, and it will continue to be. No matter how much we bristle to hear it, the world is not free of allergens. Our kids have to learn to navigate it, and while we can’t expect them to do it themselves in preschool, their training begins now. The sooner you teach them the safety rules, and make them practice (rather than you doing everything for them) the safer they will be. So think about what you want to ask for, and feel out prospective schools to see if they will accommodate your requests. You will feel much safer sending your child to a school that is onboard with safety accommodations–if they agree but are reluctant, you will always be wondering whether they are actually following through when you aren’t around. Find out how they intend to communicate allergen information (such as food bans) to other parents. If handled professionally and compassionately, you’re unlikely to encounter resentment or have parents fail to cooperate, but if handled badly, there can be arguments, hurt feelings, and the sense that your kiddo isn’t safe. If they don’t allow foods, that should be presented to all parents (they can’t just put up one sign but never talk about it) and done so matter-of-factly, for everyone’s safety. If they seem like they resent being nut-free, that attitude will percolate to the parents and the parents may resist. Our preschool was nut free before we attended, and remained that way throughout. They were great about making sure the parents knew what was acceptable and what was not, and the other parents were very supportive. I never requested that Zax’s class become egg-free, as he was capable of being near eggy baked goods without incident. I did provide egg replacers for classroom baking projects though, so everyone could safely participate. If he’d had a history of being contact-reactive to egg in baked goods and such, I probably would have requested more accommodations. Once you have all these questions answered–for one school or for several that you’re considering–decide what makes you feel most comfortable. Remember that this doesn’t need to be a permanent decision–unless you are in a remote location with one preschool choice, you can always switch to somewhere else (or just pull your child out) if things aren’t working. Also remember that preschool isn’t required, although having been in a classroom setting does give kids an advantage when starting kindergarten. 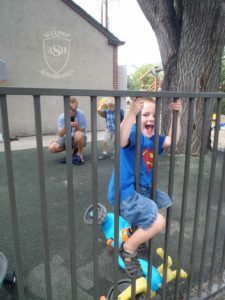 For many of us, preschool is the first major step towards independence that our kids will take. Be careful when selecting one, but don’t forget that your child should be having fun. And you should, too. Your kids are only little for a short time, and those splotchy paintings and macaroni/bead necklaces are precious reminders of early childhood. Treasure them. Thank you for sharing! it is really helped me understand the value of cleaned school and also it helped me choose Little Angels.